There was once a little girl and she was terribly bored. There was nothing to do, and not only was there nothing to do, there was absolutely nothing at all. Since there was absolutely nothing the little girl decided, quite confidently, that the first thing she needed was space. “Nothing is nothing, she thought, but space is definitely something. It’s open and it can be filled.” She was surprised how easy it was to create space. Just like that. The little girl liked space. It made her feel free. For quite a long while that was enough for her. Until she felt the need for something else, something a little more substantial, though she didn’t want to lose the sense of space she loved so much. She created moisture. She was proud of herself for coming up with such a good solution. Her creation still felt infinitely spacious and yet now, it also felt full. She closed her eyes sensing the coolness of the moisture upon her skin, and as she did she saw darkness, a darkness as vast and as beautiful as the space she had created. The little girl rested within this moist coolness and safe darkness for a long time. She enjoyed being creative. Feeling mischievous, she awoke with a sparkle in her eyes. She wanted an adventure. She decided, in one fell swoop, to create every thing in the world that ever would be. She hadn’t realized that she had inadvertently created time, and she had no idea of just how many things that would be, but then again she had made a tremendous amount of space. To make sure she had indeed created all the stuff of the world, she made light to shine upon everything she created. It was turning out to be an exceptionally busy but good day. Suddenly there was utter chaos, and it was exhilarating. She hadn’t as yet names for anything, and she hadn’t the foggiest idea of what all these things were for, but she loved watching them floating in her space. Some things were moving slowly and some things were whizzing by dangerously fast, so fast that sometimes things would collide into one another, creating loud sounds. She had never heard sounds before. All this commotion was intoxicating. It was awesome. But after a while the little girl began to get dizzy. Nothing ever stayed in the same place! Something would appear that she loved and then, in a flash, it would be gone. Never to be seen again. Or worse, something would smash into what she loved and it would shatter into a thousand pieces. Her dizzy spells continued. She didn’t want to get rid of everything. She didn’t even know for sure whether she could de-create something. Then she came up with what she thought was a great idea. She decided to create gravity and ground, and the moment she did, everything, literally, fell into place. She couldn’t believe how good this felt. It was as magnificent as her first experience of space. Everything was sitting comfortably. Everything was at rest. Everything was settled and seemed entirely happy exactly where it was, and exactly being what it was. There was some logic to where everything was but the little girl did not yet know what it meant for something to be logical. After a while she realized that even with all the stuff that was now in her world there still seemed to be an equally infinite amount of space. This seemed mysterious to her. And there was still plenty of moisture. In fact, by creating gravity and the ground, some of the moisture had become more substantial and concentrated and had fallen, making oceans and rivers and waterfalls, which for some unknown reason made her feel quiet inside and happy. Everything looked beautiful to her. All at once she realized that, since she started creating, she hadn’t been bored for a second! It was as if she had discovered the secret to happiness. Creativity. She was content for a very, very long time, for eons. The little girl was so utterly content, that is until she realized she had not had a really creative idea in a long time. And then she did. Out of the blue, (why the sky was blue she did not know), another idea popped into her head. She wondered where on earth these ideas came from. She thought, “What if I could create creatures who had entirely different ways of perceiving and experiencing this beautiful world I have made?” So she created creatures that could see her world from above, and creatures that could see under the water, and creatures that lived within the ground itself, and creatures that lived in the trees. She created creatures that lived where it was hot and creatures that lived where it was cold, creatures that could see, and smell, and taste, and hear and touch the world she had created, all simultaneously experiencing the same world differently. “Why, she thought, that would be like creating millions of worlds inside of the one world I created! That struck her as quite clever and efficient. The little girl spent a long, long time just watching all these creatures and comparing one to the other. Again there was some kind of logic to the whole thing but still she did not know what that meant. Soon this was to change. After a long while her curiosity got the better of her. What was making her world go round? What made the creatures in the air able to be up there? Why did some creatures eat other creatures? Most amazing to her was how these creatures seemed to come and go. New creatures would appear while older ones would disappear. Creatures tended to be small at first and then got bigger, and the trees too. What was that? The questions seemed endless. Another idea popped into her head, but she was not sure whether it was a good idea or not so she did not act upon it right away, which she thought was very mature. She loved the world so much as it was, even if she didn’t understand it. “My world seems to understand itself, she thought. It knows exactly what to do. Maybe I should stop here. This feels complete. Everything works. It’s beautiful. It’s interesting. Who cares if I don’t understand it?” But the questions kept coming. They were beginning to make her uncomfortable, sometimes even unhappy. And so even though the little girl felt a funny feeling in her stomach, she went ahead and did it anyway. She thought, “Well, how am I going to find out if this is a good idea or not if I don’t try?” There seemed to be something logical about that too. She mustered up her courage and made it so this one kind of creature could think and then right away she realized these creatures would need to be able to communicate their thoughts to one another if they were to be able to figure things out together, and so she created a bunch of languages because she thought a bunch of languages would be more interesting than just creating one. Without noticing it, (she had been so, so busy), the little girl was growing older. She had seen a lot, and done a lot. She began feeling tired, something she’d never felt before. “Perhaps it would be good for me to rest for a while and spend a little time not creating,” she thought. The little girl spent a long while simply gazing at her creation. “It’s good,” she thought, “very good.” She loved her world. Sleep was coming over her as if she were being covered with a soft, warm blanket. She thought, “I think the world will be okay for a little while if I don’t watch it.” Again there was that funny feeling in her stomach, but before she knew it she had fallen fast asleep. This brings us exactly to where we are now. Our little girl remains asleep. As she sleeps our thinking creatures have been busy trying to figure everything out. They’ve found a lot of answers to a lot of her questions. On this front, they are doing very well, even though there remain far more questions to be answered than the ones they have answered because each answer they come up with seems to create new questions. These creatures may be busy for a long time, maybe forever. I say maybe forever because it seems that thinking as much as these thinking creatures do brings with it strange side effects, something the little girl could not have predicted. One of the side effects is that these creatures seem not to care very much about the other creatures or, for that matter, about anything the little girl created. The thinking creatures seem so busy thinking and trying to figure everything out that they don’t notice how beautiful everything is, how everything works together, how well it all takes care of itself. As our little girl sleeps, the world continues on its own course without her. I know that sooner or later she will wake up, and when she does I wonder what she will find and what she will think about it. I am sure once she sees the lay of the land another idea will pop into her head. After all, she is a very creative little girl. You might wonder how this story of Genesis popped into my head. Without my knowing it, it had been writing itself for a long time. After many years I began to discern a sequence within my method for helping people create more of the kind of world they wished to live in. The story of our little girl, and the creation of her world, unfolds precisely in this sequence. It’s a story that contains within it my pedagogy, the genesis of one way of working with people. There is nothing like the concept of nothingness to put life into perspective. The prospect of individual non-existence can have a sobering affect. And it can have a freeing affect too. Eliphalet Oram Lyte wrote a little ditty that expresses my attitude as a teacher, the mood I do my best to create within my workshops and classes. We’re all here rowing our own boats. We are all going down the same stream to the same place. It’s not our stream. We don’t know where the stream will carry us. Our boats don’t belong to us either, but we are responsible for taking care of them. We want to learn how to row our boats gently, that means to me, without excessive force. We want to develop the sensitivity to discern the undercurrents, and the perceptivity to read the river. And when we can, why not bring a bit of merriment to our little adventure…merriment, that is, buoyancy, liveliness, zest, lightheartedness, warmth, friendship, festivity, hilarity, and pleasure? Life is but a dream. Could be. Who knows for sure? Can we know for certain that we are not being dreamt? Could it be we are but figments of one creative imagination, seemingly alive within a very realistic dream? But whatever the case may be, best not to take ourselves too seriously. When something seems unimportant, that’s the time to take it seriously. When something seems vitally important, that’s the time to crack a joke, to smile, to have some fun. Why? Because it just works better that way. When people are not trying too hard to get it right they have more fun, and when they have more fun, they learn more. That’s where I begin, with a person’s sense of space. For me, the sense of space is a sense, just like our other senses. There is essentially no space within our bodies, but with training we can come to sense a tremendous amount of space within us. We can be in a packed subway car, everyone pressed against one another, and feel a tremendous sense of space and relaxation. There is learning to see and sense the space all around us in such a way that it actually supports us like an invisible spider web, allowing us to sit comfortably in the center of our world. There is the lively space between, between us and our computers, between us and our food, between us and our thoughts, between us and those we love and those we don’t. This is where I begin. One the second day she closed her eyes sensing the coolness of the moisture upon her skin and as she did she saw darkness, a darkness as vast and as beautiful as the space she had created. When I begin to use my hands to help awaken a person’s kinesthesia and propriception my hands have a way of getting under the skin, of finding fluidity within them, a kind of underground stream streaming throughout them. I am water touching water. This sense of moisture is new to most people and they find their eyes closing. They want to sense this moisture within a vast inner space. On the third day some things were moving slowly and some things were whizzing by dangerously fast, so fast that sometimes things would collide into one another, creating loud sounds. She had never heard sounds before. The world sometimes feels like this when we’ve got lots to do. We’ve got to get to work, but first we have to make lunches for the kids, and drop them off at school, then pick up our coworker whose car broke down. I ask students to bring me the “stuff” their lives are made of, their responsibilities, their projects, their problems, their pain, and their pleasures. It’s easy to become overwhelmed. It’s as if the world we’re whirling around us. It’s as if someone were stirring things up. How can we allow the stirring to stop, how can we let the mud settle to the bottom until the water is clear? On the fourth day she decided to create gravity and ground, and the moment she did, everything, literally, fell into place. Humans need mobility and stability. Objects are great at showing us how to be stable. They know how to sit, how to receive support from the ground, so they can rest, so they can just be where they are and what they are. They know how not to fidget, how to be still. Humans need to learn this too. As far as gravity is concerned there is only space and stuff in this world, and humans classify as stuff. Gravity treats us the same way it treats every thing and every one. Gravity is fair. It’s our responsibility to learn how to work with gravity. We live on common ground, shared ground. The same ground supports us all. We’ve got to learn how to come down to the ground. We must come to realize we were all created equal. From where doth our support come? It comes from the ground. But sometimes we must go down to get it. A big part of my work is re-introducing the sensory world to people. We have spent time becoming oriented, fluid, and stable. Now it’s time to enliven and refine our sensory life. It’s not about sensory indulgence. The senses can take us way beyond pleasure. The senses allow us to gratefully receive the subtle magnificence of the world in which we live. Paradoxically, through the senses we get a glimpse of something beyond the senses, we get a glimpse of the essence of life itself, of life speaking directly through its own language without interpretation. Through the senses we experience communion. On the sixth day the little girl decided to take one of the creatures she had invented and make them capable of thinking about her creation. Once my students have had glimpses into another way moving, sensing, and being in their world, their curiosity awakens. The questions start coming. “How come we lose our mobility and stability?” “Are there cultures who don’t lose it as much?” How about other animals?” “Is there some structural flaw in our upright structure?” “What makes us able to be upright?” “Why is it so difficult to continue to sense ourselves kinesthetically?” Mostly I say, “I don’t really know for sure.” We begin to think about thinking? Are there different ways to think? Cognition. Meditation. Contemplation. Awareness. Consciousness. Intelligence. Sensory Intelligence. We begin to find language for our new experiences. Together we enter a world of wondering. On the seventh day the little girl thought, “Perhaps it would be good for me to rest for a while and spend a little time not creating,” she thought. The little girl spent a long while simply gazing at her creation. “It’s good, very good,” she thought. She loved her world. You can’t do anything forever. Obsessing doesn’t help. It’s not healthy. Sometimes you just have to forget about the whole thing. Take a break. Don’t think about yourself or your work. “You’re fine exactly the way you are,” I tell my students. I tell them, “Never change. I love you just the way you are!” Everyone smiles. I encourage people. I know people do the best they can. I don’t evaluate people. Through this work goodness in people rises to the surface by itself. I don’t know why. Goodness, and love too. Love for the world, love for others, love for themselves. And love for that little girl. I’m not the sort of person who figures things out for myself. When I get lost, which is often, rather than look at a map, (I’ve no smartphone), I will usually ask someone. I enjoy the encounter. I listen, understand, and then a thick fog passes by and I find I’ve forgotten most of what they just told me. I turn and ask someone else for help until, by and by, I get to where I am going. I don’t like reading instructions either. This does not help. What I do is ask someone to teach me how to do what I don’t know how to do. I like this. I love having people teach me. I like learning directly from a person. Is that bad? Well it is when you are sitting alone in your kitchen wanting to find a literary agent and you’ve got no idea how to go about it, and no idea of whom to ask. So I ask the oracle. How to find a literary agent, I ask. I am transported to AgentQuery.com. I’m reading. Whosever writing for this company is doing a great job. He or she is so personable I feel like they are right by my side teaching me just what I need to know. (Of course, I have no idea if this is true.) They teach me how to search for a literary agent who might be interested in what I am writing about. They teach me about how to write a query for a work of non-fiction. I decide simply to follow their directions, to follow them to a tee, as is most strongly suggested. One page. One sentence, referred to as “the hook.” After hooking them, one paragraph to reel them in to wanting to know more about you and your book. A brief, pertinent bio. Thank them courteously and then say goodbye. If they ask you to include some of your manuscript, do so, and if they don’t, do not. I did it. I followed the simple directions. Here it is – the hook, the reel, the bio, the thank you, and the first 25 pages of what I hope will be a published book that you can actually hold in your hands. Of course, as my Alexander teachers taught me, I am not holding my breath. It seems unlikely that the first people I send a query to will want to take me on as their client, speaking on my behalf to the most prestigious publishers but, Carol Mann and Tom Miller, I hope you do. If Carol and Tom should not, I ask all of you who read this for direction, for help. Alert me if you know of a literary agent or a publisher. Offer me guidance if you know your way around this world of books and business. And if you are so moved, let me know what you think of my little project. As one who has held in my hands, in my arms, 15,000 people, whose primary sense is touch, who has lived life as a blind man who happens to be able to see, as one who has traveled this world teaching a simple song of physical and spiritual grace, I attempt here to lay the foundations for a theology of touch. What is the connection between body and being, between the sensory and the spiritual, between movement and meaning? What does it mean to be tactually literate, to have educative hands? How can we, as educators, as therapists, as parents discern how our students, patients, and children interfere with themselves, somatically and spiritually, so that we might help them suffer less and enjoy life more? Touching The Intangible – Towards A Theology Of Touch tells of the sensibilities and values those of us who teach through touch must cultivate if we are to venture beyond the welfare of the body, and into the workings of the soul. Stories; of an aging mother no longer able to lift her disabled son, of a doctor in a race against time, of an adopted child who cannot eat or smile, of a man who can’t stop blinking, of a woman in search of her real voice, stories of transformation through touch, stories pointing the way toward a theology of touch. — 50 years experience as a movement artist and educator. — 1982, founded the Alexander Alliance International, an intergenerational, multicultural community/school dedicated to the training of Alexander Technique teachers currently with branches in Germany, Japan, America, and Korea. — 30 years traveling annually throughout Europe, Asia, and the United States helping people understand and experience the interconnectedness between physical and spiritual life. — A lifetime of disciplined training in Gymnastics, Modern Dance, Contact Improvisation, Alexander Technique, Tai Chi Chu’an, Aikido, Chanoyu, (Japanese Tea Ceremony), Argentine Tango, and Kyudo, (Zen Archery). — Taught members of the Berlin Philharmonic, Radio France, The National Symphony, the Honolulu Symphony and for the Curtis Institute of Music. — 13 years teaching annually for the Five College Dance Program in Amherst, Mass. — Taught the Alexander Technique for the tango community in Buenos Aires. — 6 years teaching Movement for the Actor at Temple and Rutgers Universities. — 10 years teaching annually for the College of Physiotherapy in Gottingen, Germany. — Currently, lives half the year in Osaka, traveling throughout Japan and Korea working with physical therapists, occupational therapists, speech therapists, psychologists, dentists, yoga and Pilates instructors, movement research specialists, classical pianists, and with the traditional Korean music and the traditional Korea tea ceremony communities. — Lives the other half of the year in northern New Mexico, hiking and writing. Thank you for your time and consideration. I believe I have a substantial social platform of support upon which this book could be successfully launched. I include the first 25 pages as requested. I do have a first draft of the entire manuscript ready if you should like to read it. As I became part of the apple, the apple became part of me. And that is how I came to understand the existence of things. Touching the tomatoes in the garden is surely seeing them as fully as the eye can see. But it is more than seeing them. It is the end of living in front of things, and the beginning of living with them. No one knows the story behind Michelangelo’s choice. What I do know is in the Torah the story goes that God blew the breath of life through Adam’s nostrils. Breath was the vital force. When painting the Sistine Chapel Michelangelo chose not to depict the creation of Adam through this image. He chose touch, not breath. God touches Adam, and Adam begins to live. That’s closer to how it works. Two people embrace. Spermatozoa race toward the ovum. Only one will penetrate the ovum’s protective layer, allowing the genetic material of the biological father to touch, then merge, with the genetic material of the biological mother. 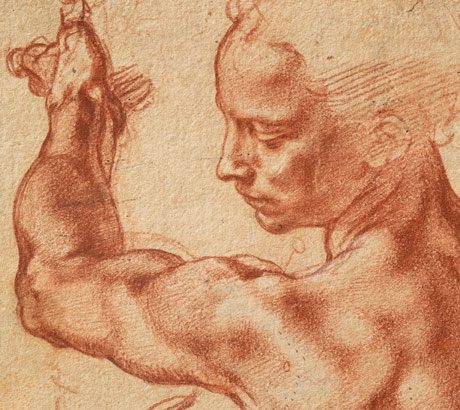 Michelangelo’s depiction of Adam’s creation may be more widely known than the original. Michelangelo re-conceived the creation of man in his own image. He was the ultimate creator of the human form, a man who brought, through touch, the lifeless to life. No wonder, when I was thirteen and saw for the first time Michelangelo’s Pieta at the Worlds Fair in New York in 1964, I wept. And wept. My mother had no idea why. Neither did I. Was This Book Written For You? …people interested in the relationship between physical and spiritual grace. …people interested in touch, but especially for people who use their hands to help others. … people interested in the interplay between sensory life and spiritual life. For anyone seeking to live a spiritually embodied life. …counselors, psychologists, psychiatrists, and therapists of any kind who want to learn how to better listen, see, and be with their patients. … body workers who want to learn how not to work on a person’s body, but through a person’s body. For movement artists and educators who better wish to understand how meaning underlies movement. … all teachers who want to be better teachers, who want to learn how to quickly and deeply connect to students, how to foster trust, how to teach through the telling of stories, through metaphor, and through movement. … performing artists, actors, musicians, dancers and singers who wish to know more about authenticity, about presence, and about inner beauty. … people who are interested in Taoism and in the teachings of Lao Tzu. … people who want a good introduction into what the Alexander Technique is and what it is about. … people who are currently students of the Alexander Technique who wish to incorporate the work into their everyday lives, and into their way of being in the world. … people who are training to be Alexander Technique teachers or who are currently Alexander Technique teachers who wish also to learn how to impart Alexander’s work outside of his procedures, who also wish to be able to teach effectively in groups. For Alexander trainees and teachers who want to take the work beyond the body. For Alexander trainees and teachers who wish to teach more from the heart. For Alexander trainees and teachers who wish to find contemporary language for Alexander’s work. For Alexander trainees and teachers who wish to explore the relationship between Alexander’s work and spiritual life. This book unfolds from beginning to end, leading you deeply into the work at hand. At the same time, each essay stands on its’ own. Poise occurs by itself when we stop interfering with it. The hitch is we don’t know precisely how we are interfering with it because we can’t feel the interference. What we do feel is the result of the interference, some particular or generalized strain, effort, tension, or fatigue. It’s there. We’re uncomfortable, and we don’t know how to become comfortable. We try to sit up straight, or we stretch for a while, but soon enough this lack of ease, this lack of support returns. We go back to work with this sluggish sense of weight, this thickness we have to push through to get anything done. Or we go back to work so revved up that we don’t feel a thing for hours until we stop and find ourselves hurting, or totally wiped out. Poise. It’s elusive. We see very young children, how lightly suspended they are, how lithe, how nimble. They’re not trying to do anything right. They’re just naturally buoyant and springy. Unwittingly, from the inside out, we sculpted “a tension body”, a body made of tension. It takes a lot of energy to keep two bodies going, especially two bodies that aren’t getting along. While our real body is putting its foot on the gas pedal, our tension body is putting its foot on the brake. We feel un-free, enslaved by our tension. This is the opposite of poise. Poise returns as you begin to distinguish your tension body from your real body. 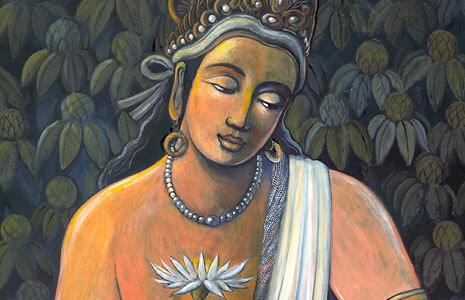 As you become acquainted with your tension body, you can ask it, kindly, to let go of you. As it does, your tension body generously gives you its energy, its very life. The conflict ends. You’re free. On this particular day, in Japan, in a hospital, I am with physical and speech therapists. I have two days, fourteen hours. Two professors of Physical Therapy invited me because it has become apparent to them that, when it comes to educating physical therapists, two key elements are missing: how they use their hands, and how they use their bodies when they are doing their work. Physical therapists in Japan get a lot of theory in school. They learn a lot of specific techniques for a lot of specific problems. But they don’t have a class called Touch 101, or Movement for Physical Therapists 202. They just don’t, and these professors are beginning to wonder why. There are about thirty-five therapists in the room, about seven Alexander Technique teachers. That should work. The workshop begins. The Alexander Technique is not a technique, not in the same way you guys learn techniques for working with adhesive capsulitis (frozen shoulders or in Japan as it is known, the 50 year old shoulder), or hemiplegia (severe strokes), or dysphagia (swallowing disorders). The Alexander Technique is not a technique for anything particular. The Alexander Technique is a field of study. It’s an inquiry into human integration, into what integration is, what restores it, and what disturbs it. It’s a foundational study. Integration underlies everything we do. The more of it we have, the easier it is to do what we’re doing. So what is integration? You PTs help people a lot with strength, flexibility, and coordination, super important for everyone. Integration includes all of these but is, at the same time, something distinct from them. For example, a baby can scream for an hour and not lose its voice. Why is that? Why can’t a grown up do that? A baby will reach for something, but never over-reach for something. They will only extend their arms or legs so far and no farther. Why is that? Babies will work for a long time figuring out how to pick up a pea on their plate but will never distort their hands or bodies while they’re doing it. They just won’t distort themselves. They are somehow prewired, preprogrammed to remain whole, all of a piece, a flexible unit. That’s integration. So why do we lose it? I don’t know. I don’t know a lot of things. How do we lose it? I don’t know that either, but I’ve got a few theories. What I observe is that in the process of our becoming coordinated, something happens. At some point we’ve got to learn how to button our shirt, tie our shoes, eat with hashi, (chopsticks). We’ve got to learn how to speak, how to ride a bicycle, how to write kanji. Did you ever see little kids trying to write kanji? There you can see it. Children disintegrating. Their tongues are sticking out of the corner of their mouths, they’re not breathing, their heads are hanging down, spines bent and twisted, little hands gripping their pencils for dear life. And the more pressure around learning, the more felt fear, the more the body just falls apart. There’s no preventing it entirely, no matter how great your parents are, or your teachers, or your culture. Sooner or later it’s going to happen to everyone, more or less. The fall from grace. Somehow, we’ve got to find our way back to the garden. It so happens that Marjorie L. Barstow, the first person formally certified to teach the Alexander Technique, and my mentor for 16 years, took Frank Pierce Jones, a man she helped train to become an Alexander teacher, a classics professor at Brown University, an East Coast intellectual, a man who would never find himself at a western rodeo, except for on this day, when Marj wanted to show him what the Alexander Technique was all about. Okay Frank, in a minute a big, mean, steer is going to explode out of that gate, and out of the gate next to it, a cowboy on a horse is going to burst out, and that cowboy is going to do his best to lean over, grab that steers horns, dig his heels into the dirt, and take that steer down. And that steer is going to do his best not to let him. The gates open. Frank watches. He sees the cowboy lean over, take the horns, snap them back, jam the back of the steers skull into his massive neck while twisting that neck to the side and bringing that steers head to the ground. The steer, unable to stay on his legs, crashes to the ground. What did you see Frank? Not too much, Frank says. Keep watching Frank. They watched, and as they watched, little by little Marj got Frank to see exactly what was happening. You see Frank, the cowboy snaps the steers’ head back, and jams it into his neck. That compresses his entire spine. Now the steer can’t breathe. His front legs begin to buckle. His pelvis tilts under. His hind legs can’t get any power, any traction. That steer’s got nothing left. The man’s in control now. There’s one last cowboy to go. Looking down at him as he sits on his horse, Frank can see that this cowboy doesn’t look well. He’s slouched back in the saddle, the horse’s head is dropped way down. Maybe he was out late. Maybe he drank more than he should have. The gates swing open, the steer gets the jump on him, the cowboy catches up, leans over, grabs the horns but can’t seem to snap the head back. Rather than the horns going back, Frank sees them rotating slightly forward, the neck looks enormous, the steers’ ribs are widening as air fills his huge lungs. The steers’ body seems to be getting longer, his front legs are dropping under him, his pelvis is out, his tail is up, his haunches powerful, his back hooves driving him forward like a train. Meanwhile, the cowboy looks like a flag flapping in the wind. This time around, the steer’s in charge. Now that’s the way of it, that’s how it works, that’s what we’re after, Marj says. We’ve got that kind of organized power in us too. We’re just interfering with it all the time. That’s what Alexander figured out. And that’s what I mean, I say to the class, when I use the word integration. I mean that naturally organized freedom and power that’s in all of us. I can see I’ve got everyone’s attention. I’ve been telling this story as much with my body as with my words. I see that everyone’s been sitting for a while, so I say, Okay, enough sitting. Why don’t you stand up. The second they start to stand up I tell them to stop and just stay where they are. Don’t move a muscle. Where are your horns? I mean, if you had horns. Are they rotating forward or are they rotating backwards? My eyes see one guy whose head is pretty jammed into his neck. I walk over and kneel down on one knee in front of him. I invite everyone to come closer so they can see us. I scoop his head lightly into my hands the way my grandmother would do to me when she greeted me, and I gently tilt his imaginary horns forward. His spine surges up. Everyone can see the power filling his body. That’s the steer, I say. Now here’s where it gets interesting. We’ve all got a steer inside of us. I call that your mammal body. And we all have a cowboy inside of us. That’s your acquired body. And sometimes our acquired body works against our mammal body. There’s a conflict in there. We’re fighting against ourselves. And it can get dangerous. The steer can get hurt, and the cowboy too. Now our cowboy can’t take us down by our horns because we don’t have horns, and besides, the cowboy is not outside of us. So how does the cowboy within us bring us down? Well, instead of coming at us from on top of our heads, he comes at us from below our heads, from our necks. It’s like he’s hiding there inside our neck, looking up, reaching up, and pulling our skull back and pressing it down into our spines. That’s not the only place where he hangs out, but it’s definitely one of his favorite places from which to operate. Here’s what’s very cool. Our mammal body has got a lot of energy in it. And our cowboy body does too. Now if they’re going at each other, they’re using up all of our energy, and that’s the energy we want to be using to get on with our lives. If we can get the energy of the mammal body and the energy of the cowboy body to harmonize, to work together toward a common purpose, if we can get them both working for us, not busy fighting against each other, then just imagine how much energy that would free up. And that’s why it felt so effortless standing up. Not only was the cowboy off your back, the cowboy was actually helping you get up! So you’re going from having almost no available energy to stand up, to having a surplus of energy to stand up. Now, that’s exciting. Imagine what it would feel like to work with patients with all that organized energy, what it would be like to move through your day like that. Over the next half hour, I do this with about ten students. I make a point of always catching a person unaware that their horns are pulling back. Don’t move, I tell her. You’re perfect just like that. Okay, I’m going to be the cowboy. I place my hands around her head, but this time I put a slight pressure with my little fingers against the back of her neck and take her more into her “disintegration pattern,” gently getting her throat to bulge forward and down, which immediately tilts her head back, collapses her chest, and tucks her pelvis under. Supporting teachers, I call out! It’s time to give everyone this experience! I can sense a bit of panic in the air. I know what they’re afraid of. Don’t be afraid of taking people down, I say to them. Do it., but do it slowly and gently. It’s good for them. It’s good for everyone. We want to get springy down there. When you buckle a person’s neck forward and press their heads gently into their spines, it’s an intelligent response for the body to go into a collapse pattern. If the spine is too rigid and can’t do that, there’s a problem. So take people down, softly, and get them to know what’s happening down there. Lead them down in a way that makes their spine springy. Load the spring. Fill it with potential energy. Then take the pressure off it and let the spine spring back up. Get to work. Have fun. By the end of the first morning we are off to a good start. Everyone’s got a clear idea of what the work’s about, what the workshop is about. They’re beginning to be able to see what the cowboy within looks like, and what the steer within looks like. They’ve all felt the power of their mammal body when the cowboy is working for it, and the weakness of the mammal body when the cowboy is working against it. I want to tell them about their own countries story of the ox and the ox herder, about the boy who finds the wild ox and tries to tame it, and has a real hard time of it, how they both end up exhausted. I want to tell them how, if they just hang in there for forty years, the ox and the ox herder will come to trust one another, like one another. The fighting will stop. But I decide not to go there. Have a good lunch. Get some fresh air. Move around. Rest a bit. Come back ready to work. Doumo arigatou gosaimashita, thank you very much, I say, bowing, grateful after all these years to still be teaching, grateful there are young people out there interested in what I know. Doumo arigatou gosaimashita, everyone repeats, happy and energetic. Mounting the ox, slowly I return homeward. The voice of my flute floats through the evening air. In rhythm with the beating of my own heart. If you look closely at some of the large figures on the ceiling of the Sistine Chapel, you may notice something peculiar. A good number of them have books in their hands. It seems they want to read. Often kids are bothering them. Perhaps Michelangelo also wanted to read but was always being interrupted. When I was a modern dancer, I wanted to read too, but I was either in technique class, or rehearsing. I remember seeing a bumper sticker that read, I’d rather be dancing. I knew, straight away, that person was not a dancer. If they were a dancer their bumper sticker would have read, I’d rather be reading. There was one figure on the ceiling of the Sistine Chapel that mesmerized me, that possessed me, that became my muse, and eventually the logo for my community/school, the Alexander Alliance. She was the Libyan Sybil. When I began using her image as the logo for the Alexander Alliance, students wondered why, why the Libyan Sybil? And as I often do, and did then, I answered their question with a question. She’s got a great back. Once I feel my students have seen what they are going to see then, if there is more I want to direct their attention toward, I will. Notice how Michelangelo figures often appear androgynous. I like this. Often as men undo their culturally acquired masculine holding patterns, they feel more feminine. And as women undo their culturally acquired feminine holding patterns, they feel more masculine. I move people away from their acquired gender bodies and into their mammal body, the body that men and woman share, their human body. She’s got a beautiful synergetic flexion of the hips, knees and ankles. We want that happening in conjunction with an expanding back that is emanating power through the arms into the hands, and through the spine and into the skull. And the Libyan Sybil has got all that going for her. Something else I love about the Libyan Sybil is her upper appendicular skeletal system, her arms. They remind me so much of my mentor’s, Marj Barstow’s, arms when she worked with us. Marj’s scapulae were wide. Her shoulders were neither up nor down, more just out and away, one from the other. Her elbows and wrists were articulate. Her elbows were ever so slightly back and out, creating room between her arms and torso, while her wrists were going in slightly toward the mid-line, exactly as you see here as our sybil holds her very, very large book. Marj’s arms always looked natural and elegant. Her hands looked at once easy and powerful. Really, Marj’s arms were just like the Libyan Sybil! Then there’s that exquisite spiraling throughout her body that you’ve noticed. Let’s look more closely at what is going on there. There’s a descending spiral, and an ascending spiral. The descending spiral begins with the head and eyes. Something’s got her attention; something’s turning her attention away from her book. The descending spiral is primarily concerned with orientation. Your orientation begins to change. You hear something, or you see something, and your orientation to the world shifts. You can see this descending spiral happening in some of our other readers too. Go and take a look. Now what about the ascending spiral? From where is that initiating? That’s what it looks like to me, from the ground, and then sequentially up through the body. So if the descending spiral is about orientation, what’s the ascending spiral about? Maybe action. It’s helping her to hold up the book. Power to do what she’s doing. That’s how I see it too. Maybe she was oriented more fully toward the book and then something got her attention and Michelangelo caught her just at that moment of transition. Why would he want to do that? The cool factor is very important. The Libyan Sybil is a super cool figure. Just imagine how cool the Sistine Chapel was when the first people ever to enter that room looked up and saw these huge three dimensional figures almost falling out of the ceiling. Painting was not Michelangelo’s thing. He was a sculptor. He was forced to paint the Sistine Chapel. So he discovered new techniques for making his two dimensional figures appear three-dimensional. Michelangelo likes that transitional moment because change is taking place. But you don’t know what she’s really doing or why. It’s mysterious. Is she opening the book or closing the book? There’s action. She’s in motion. He’s not just painting form, but motion, coordination, emotion, drama. He’s a motional and emotional anatomist. He’s a storyteller. Now when you really think about it, there aren’t two spirals. There’s just one. Imagine you are holding a wet towel. Get your scarf, or your coat, or a towel, and try this. Hold it in your hands and turn your top hand gently in one direction as you counter that action by gently turning your bottom hand in the other direction. Imagine turning it so gently that no water is squeezed out of it. When we wring out a wet towel our spiral turns into a twist. An area is created where both movements oppose one another and stop each other, creating torsion. But if the spiral is gentle enough, and if it moves through the whole towel, there is no conflict, there is no blockage, there’s just one integrated spiraling motion occurring in two complimentary opposing directions. The Libyan Sybil, for me, is the symbol of a person who can gracefully transition, change direction, change opinion, adapt, without losing poise, without disturbance. Imagine being a parent who is trying to do something, like read, or cook, or pay the bills and your two young children have just started fighting with each other. How are you inside of that transition? How gracefully can you shift your attention? How do you adapt to changing circumstances? Let’s compare our Libyan Sybil to another figure, one of the Ignudo figures, one of the twenty naked, muscular figures on the Sistine Chapel. Let’s take a look. What is he feeling, and what specifically tells you what he is feeling? He’s panicking. His eyes are bugging out. It looks like he’s gasping. Even his hair contributes to this sense of panic. Worried. Something about how his forehead is raised and her eyebrows are dropping down. Dreading something. I really don’t know. I feel it through his whole body. Maybe it’s in his back and neck and shoulder. And the way his upper lip is pulled up. Something bad is happening. Really sad. It could be the angle of his eyes, or the tilt of his head or the sunken feeling in his chest. Feeling hopeless. The chest and eyes. Feels threatened. It looks like he wants to get away. He’s looking back but his body is trying to go forward. Maybe. Images are like Rorschach tests. We project our inner life onto outer images. Why else would we all be interpreting what we see differently? Let’s compare the Ignudo to the Libyan Sybil. Tell me what you are seeing and the feeling it creates. The scapula’s moving down and out and around the ribs. It looks strong and graceful. The spine looks long. The neck is not compressed or shortened. It creates a feeling of balance and elegance. The eyelids are lowered; forehead and eyebrows relaxed. That makes her look calm and objective and in control. The mouth is closed. It makes her seem observant, self possessed. The head, instead of tilting back, is tilting ever so slightly forward. I don’t know, she feels dignified. Yeah, instead of looking over the shoulder by flipping the head back, the Libyan Sybil is tilting the head forward and rotating around; two ways of looking over the shoulder, but they’re so completely opposite. There is no fear. She’s quietly confident. It’s amazing. The figures are completely opposite in almost every way. That is why I juxtaposed them. You’re beginning to see how I see because you are recognizing the specific physical traits that express, (press out), the emotion (to move outward). Go ahead. Try both ways and see if it changes how you feel, emotionally. Do your best to do exactly what they are doing. And once you have them let yourself gently, slowly, softly transition between one and the other. They get to work. I sit back and watch. Again, getting to know my students. So what was that like? It’s eerie. When I take on the Ignudo, I feel scared. I start to panic. And when I become the Libyan Sybil, I grow calm. Really calm. I feel mature. Many heads are nodding in agreement. Head poise has an organizing, integrative influence, a governing influence throughout the entire body/self. 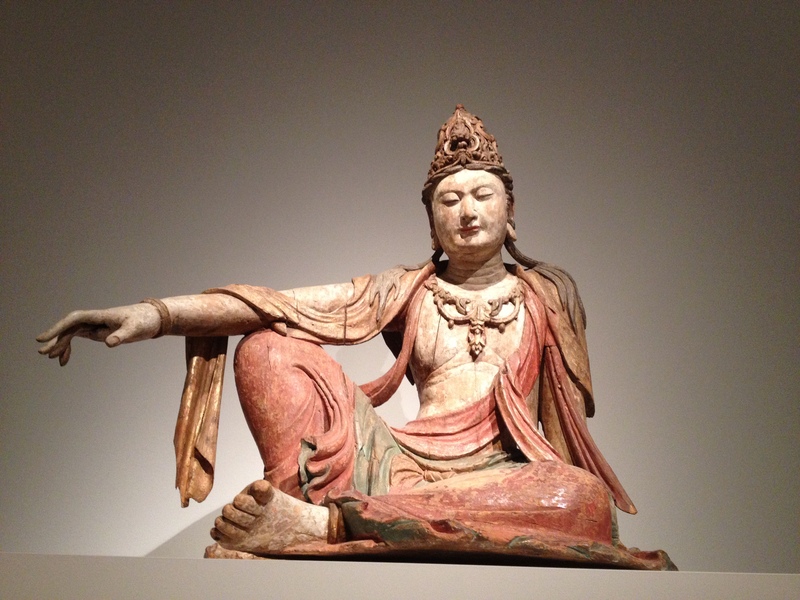 And when this head poise is disturbed, disturbance happens throughout the whole body/self. That is why a head is called a head. It’s in charge. So lets look one more time. What do you see happening to the Ignudo figure’s body? It looks really uncomfortable. The head is looking back to the right, but the right arm and upper torso is twisting to the left, and the pelvis is falling back and looks weak. His body looks stuck, disorganized, and confused. Caught in the middle. His head is in front of his torso and his right arm too. And maybe that’s counterbalancing his torso falling back. He looks really compressed in his chest and belly, and his mid-back looks like it’s pushing back with a lot of force. And his right scapula is rising up toward his ear. When I look at him, I notice I’m holding my breath. That’s a good one. It is good to kinesthetically feel what you are seeing. That’s what I call embodied seeing. Why do you think I sometimes choose to teach people about the body through art instead of through strictly anatomical drawings? Because sometimes people get a little scared around pictures of skeletons? For some people who are not academically oriented, it might feel like studying, like it’s going to be difficult, like there’s going to be a test. They’re images of humans that are not alive, not expressive. Yes, and because, first and foremost, I want you to see a person’s beauty. I haven’t seen a person who wasn’t beautiful in 35 years. And often, the more distraught the person is, the more beautiful. And through that beauty I want you to sense a person’s humanity. And only then do I want you to drop concern yourself with a person’s anatomical structure. Life is not primarily about how we use our bodies. It’s about how we are being in ourselves. So I want you to begin by seeing a person, how a person is, how a person is being, in their entirety. That’s what Michelangelo could do. Profoundly. Perhaps now you may see why I fell in love with the Libyan Sybil, and why I chose her as our school logo. It is said she has the power to “reveal that which is hidden.” Perhaps she ‘s turning toward us, opening the great book for us, inviting us to read, and to learn. Again, my thanks for your time. I look forward to hearing from you. Words. They’re important. They’re worth thinking about. It’s worth taking the time and finding the precise word or words that express your truth. It’s worth visiting those words over and over again, as your understanding of what is true changes, and then changing those words, once again, until they express your truth as it lives within you now. Certified. This word lacks beauty for me . Certified US Beef. Certified mail. Certified gluten free. Perhaps it has something to do with my having grown up in Philadelphia, a city founded by a Quaker, William Penn. It remains the only state where you don’t need a priest or a rabbi, or a government to certify that two people are married. What you need is a community. It’s your community that knows you, who recognizes you, and who cares about you. And it’s your community that supports you. A marriage has little chance of surviving in a vacuum. And so does an Alexander teacher. Thirty five years ago, when Martha and I first founded the Alexander Alliance, we chose to award graduating students by giving them a document called a Statement Of Recognition. The words had meaning. The words matched what was happening. A person who had studied deeply, who had made a real commitment, was being recognized by their teachers, their colleagues, and their students. Perhaps most importantly, by the students they had begun to teach. The reason why I say most importantly by their students is because, ultimately, it’s your students who decide whether you are a teacher. No students. No teacher. If anyone certifies a teacher, it’s their students. Marjorie Barstow didn’t certify us. She didn’t believe in certifying us. She didn’t believe it was necessary. She would say when asked if she certified teachers, “No, I don’t, however, some of my students have gone on to become excellent teachers of Alexander’s work.” She wanted us to know when we were ready to teach. Yes, there was a day when Marj said to me that she thought it would be good for my learning, if I began to teach more. But that was a suggestion. The decision was mine to make. Yes, she did write a letter saying I was a good Alexander teacher, but that was simply a letter of recommendation for a position I was applying for in a university theatre department. And so it was, in this spirit, in Marj’s spirit, that I chose the words I did for the document Martha and I gave to our graduating students. Years have gone by. Almost three hundred people have graduated from the Alexander Alliance International. I felt it was time to look again at our Statement Of Recognition, and surprisingly, the words still rang true. But something was missing. In the original document I ended by saying that the graduate was “capable of imparting Alexander’s work to others.” I have changed this to, “and has made a commitment to imparting Alexander’s work to others, respectfully and benevolently.” Knowledge is not enough, not in our work. In Judaism we speak of possessing a “heart of wisdom.” That’s what I want to see from my students; that their knowledge of Alexander’s work emanate from the heart. Graduates. Open your hands and give. Really, there’s nothing else to say. “Show me how to do that?” And I would. I would stop my own workout and teach someone how to do what I had somehow figured out how to do, like a front somersault, or a reverse kip up on the rings, or circles on the side horse. No wonder I missed making the Olympic Team. I was busy coaching. Looking back, it’s clear; I was doing exactly what I was supposed to be doing. I was supposed to be learning how to use my hands to guide someone into balance, to indicate exactly from where to initiate a movement, in what direction, and with what quality of impulse; to punch it, or snap it, or swing it, or draw it out, or press it up, or let it go. I was supposed to be developing my ability to use language to facilitate coordination. Unbeknownst to me, I was supposed to become an Alexander teacher, but when I was twelve, and first began using my hands to teach other kids how to move well, I had no idea what that was. As gymnasts we used our hands to help each other as a matter of course, and sometimes as a matter of life and death. My first coach, Bill Coco, gave me my first experience of educative/nurturing touch. “Okay Bruce. You’re going to do your first back layout with a full twist. I want you to show me your round off. Remember no more than 3 preparatory steps, one back handspring, block with your feet so you transfer your horizontal power vertically, hands reaching toward the ceiling. Don’t look over your left shoulder until I say, “Look,” then wrap your arms quickly and closely across your chest, and leave the rest up to me. Got it?” “Got it.” My faith in Bill was total. I guess that makes Bill Coco my first Alexander teacher. He taught be how to lead with my head and let my body follow. He used his hands exactly where, and only when needed, and only with the amount of force necessary. Bill looked like a boxer, more often than not with a fat, unlit, cigar in his mouth, disheveled, sported a sizable beer belly, seemed like a tough guy, and deep down was the softest, gentlest, hugest teddy bear alive. He died when he was forty. I was fifteen. But he passed on to me exactly what I needed, and no doubt he did for a lot of Philadelphia kids like myself. And so it went. Teacher after teacher, teaching me exactly what I needed to learn to get exactly to where I am now; a person who knows how to use his hands to bring people into balance, a person who knows the language of movement, and pretty much a soft, gentle teddy bear of a person, minus the cigar. But were my teachers only teachers? What else were they to me? How did they really pass onto me what I needed to learn? There are teachers, coaches, counselors, instructors, educators, professors, rabbis, priests, role models, idols, heroes, and mentors. We’ve got different names for people from whom we learn, people who pass on knowledge and skill to us, who bring out knowledge and skill from us. But what is the name for those teachers who pass themselves onto us? It’s important for me to know what, and who I am to my students if I am to best serve them, if I am to pass on to them the best in me, if I am to leave myself in their hands. Sometimes I am teacher, father, friend, coach, holy man, enemy, sometimes mentor, advocate, adversary, role model. I am exactly, at any given moment, who my student perceives me to be, and needs me to be. I know I am, in essence, none of the roles I assume. I am the person who assumes them. Marj Barstow was many things to me, which is why she made such an impression. Most importantly, she was a mirror into my future. She was the manifestation of my potentiality. I could see in her what was lying latent within me. And so I watched, and I listened as if my life depended on it, which it did. She was not a holy person, not a guru, not a mother, Boy, did she not mother us. She was not a technique teacher, not a coach. She was an artist who showed us her art, over and over again, a kinesthetic sculptor. Humans were her medium. And sometimes horses. (Marj had trained world champion quarter horses.) Sometimes I think she really didn’t care all that much about us as people. She was not a person-centered teacher, as I am. She was a technique-centered teacher. She used us to work on her technique, on her art. That was okay with us. We benefited from her artistic obsession. Marj inspired me. Her work was astoundingly beautiful, mesmerizing, like watching a master potter spin a clump of clay into a graceful bowl. Marjorie Barstow working with me. More than anything in the world, I wanted to be able to do what she did. I watched her work day after day, year after year, but I didn’t just watch her with my eyes alone. I watched her kinesthetically. I watched her with my whole body and being. I developed a kind of synesthesia. I was taking her in, at once, through all of my senses. It was like I was swallowing her whole. I “grokked” her. When I was in college and read Stranger in a Strange Land by Robert Heinlein, I knew that was how I needed to learn. “Grok” means water. To grok means to drink, to drink life. Not to chew it. Not to break it down to understand it. At the moment of grokking the water and the drinker become one substance. As the water becomes part of the drinker, the drinker becomes part of the water. What was once two separate realities become one reality, one experience, one event, one history, one purpose. Marj didn’t break things down. Marj didn’t teach us how to use our hands. After we would watch her for a few hours Marj would say something like, “Okay. Let’s divide into smaller groups. Bill, Barbara, Don, Bruce, Martha, and Mio, go and teach for a while. (Or it could have been, Cathy, David, Diana, Catherine, and Pete.) The teaching just happened. We could do it. It was as if we were riding Marj’s wave. We were grokking her. What was he to me, a rabbi, a teacher, a spiritual father? Marj gave me my craft, my art, my vocation. 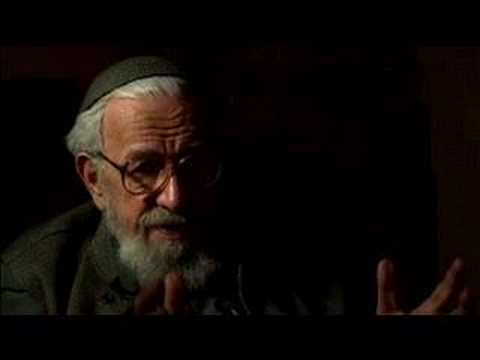 Rebbe Zalman taught me how to teach, how to sit quietly with people, as if they were in my living room. He showed me that it was fine to be silent, that it was okay to take the time I needed to think, and to wait until I had something worth saying. He taught me how to tell a story. He taught me to be unafraid to look into people’s eyes. He taught me how to think metaphorically. He taught me how to listen to my still, inner voice, and follow it. He taught me how to listen to the inner voices of others. He taught me how to bless people, and how to be blessed by them. He taught me that I could never know one religion unless I knew two, and actively encouraged my interest in Zen Buddhism, in the Christian Mystics, and the Sufi Poets, and in the teachings of Lao Tzu. And Rebbe Zalman would begin to tell us a story, and within the story there would be another story, and within that story another story, until we were transported, like children, into another world. And when we’d least expect it, at a particular point, the story would end. No commentary. No discussion. Class was over. We’d leave knowing those stories were about us, about our very lives. Rebbe Zalman didn’t have to give us any homework. He knew those stories would be working within us until next week. Marj Barstow and Rebbe Zalman were transformative educators, par excellence. They knew how to educe, how to lead us in, and then how to lead us out, out of ourselves, into places unknown to us. Many years later I met a woman, another modern day bodhisattva, another person who inspires, who teaches through example, who knows how to bring out the best in people. I spent hours, years, watching her work, watching her lead one person after another out of their confusion; I spent years grokking her, absorbing her through my pores, into who I am now. Again, I see there are no accidents. We meet exactly the teachers we need, exactly at the time we need them, so that we may become exactly the people we were meant to become. Aaah, but that is another story. Ninety percent of the time I work with people with their eyes open. I want them to see the world, and be in the world. At the same time, when people first experience deep kinesthetic lightness, often their eyelids close naturally, as if they were holding a flower under their nose, and letting its sweet scent rise up into their being. This also happens with advanced students too, when they experience, for the first time, a truly new freedom within themselves. I hope you enjoy this short video. I welcome your impressions. When you first started teaching, did you trust that your hands were directing in the way that they should or could? I am finding myself wondering if my hands are giving the student the experience that I have when my teacher’s hands are on me. I then of course go back to myself, my back and empty hands. But the thought/doubt is there. I’d love your thoughts on trust and the development of our listening hands. Did I trust that my hands were directing in the way they they should or could? The short answer? No. I knew my hands were not very good. I knew my use was not all that great either. (It still is not great.) I knew I was not giving my students the experience that I was receiving from my teacher, Marjorie Barstow. But as Marj once said to me, ‘Comparisons are odious.’ And in this case unfair. If you know more than someone else about AT and you have some skill, then you will be able to help them to the degree that you can at this time. You will likely get through, to varying degrees, with some students, and not at all with others, which can be disheartening. When this would happen to me while teaching a group, with other students watching, I would say something like, ‘That’s enough for now, good job. Let’s take a break, watch others, and come back to it again.’ There’s no point forcing things. It’s humbling when students don’t respond, but it’s good feedback. It tells you that you need another 40 years of practice. One student is practice for the next. Fake it until you make it. It’s odd, but it helps me not to think about myself so much as an accomplished teacher. (How other people see me is their own business, not mine.) I choose to see myself as a student who is doing what he loves, studying and practicing. People pay me for the opportunity to study and practice with me, because of my possessing more experience than they do. Within Jewish communities in Eastern Europe before World War II, being a rabbi was not a profession. A rabbi was someone that the community collectively recognized as a wise and exceptionally learned man, and supported him so that he had time to study and to contemplate, a kind of scholar-in-residence. That’s how I think of myself. I’m a ‘somasopher’, a person with embodied wisdom. People pay for me to meditate on Alexander’s work, which I do a lot.. People pay me to write, (Yes, I know this is a fantasy, but it’s how I choose to frame it), and people pay me to study in the same room with me. No matter the room, no matter the number of people, in my mind, I transform where I am into my livingroom and I welcome people into my home. Because I am at home in the work and with people. That takes the pressure off. I don’t have to be The Teacher who knows everything, or is great at everything, or can solve everything. Why not write your own secret job description, your own personal mission statement? It’s about relaxing into your practice. It’s about getting thousands of people under your hands, a heavenly host of people with a heavenly host of different life patterns. And having fun. Ask your students what they are experiencing, and not only physically. Ask them to be totally honest, to not worry about pleasing you. Trust their feedback, and then shift how you are working accordingly. We’re growing into ourselves as Alexander teachers. It’s an organic process. It takes its own sweet time. As for coming back to yourself, and to your back, and to your empty hands, and to your listening hands. I don’t really know what all that is for you in reality. I would have to see you, and see and experience what your hands are doing and what they are not doing. But I will say that I don’t come back to myself, I include myself. In Judaism there’s a famous prayer called the Shema, and basically it says that God is One. I take this to mean, not two. Our job is to unify, to make things one. My hands are not only empty, they are full, they don’t only listen, they speak, they communicate, they invite, they welcome, they offer, they lead, they follow, they receive, they give, they promote, they nurture, they love, they read, they explore, they suggest, they comfort, they challenge, they encourage, they praise, they give permission. So in the beginning it is not about trusting your hands. It’s about using them a lot and getting good at using them, the way anyone with a manual skill gets good at what they do, if they work at it. Then over time, based on experience, you come to trust your hands. Now, my hands know far more than I do. More than I can say. Have no doubt. Relax into your practice. Enjoy your students.